Hello stamping friend! I hope you enjoyed your weekend; ours was very rainy, and the week is going to stay that way! A perfect reason to stay indoors and stamp, I say 🙂 Today I’m going to share a sympathy card I made, using the Seasonal Layers Thinlits. Some watercolouring creates a softer background for the die cuts. 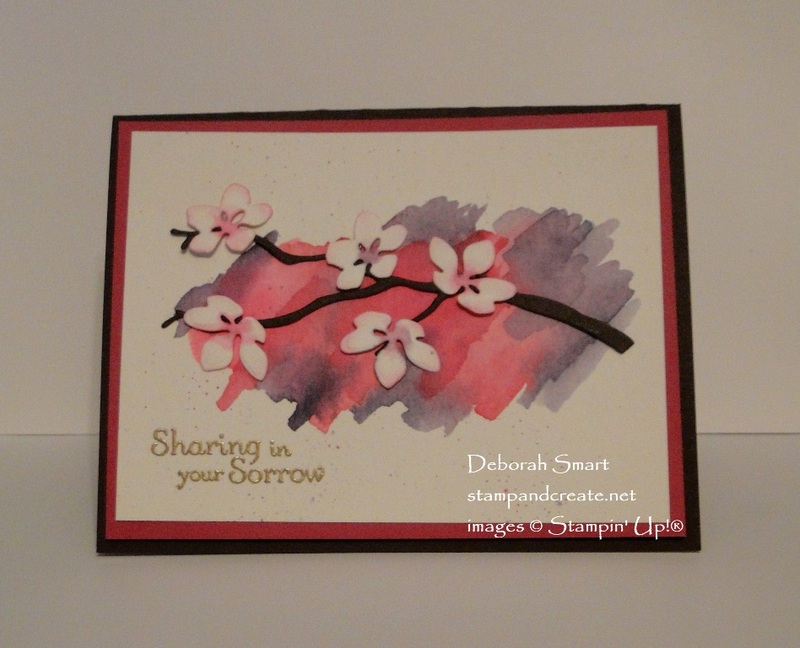 The colours I used in this card are Elegant Eggplant, Melon Mambo and Berry Burst. The card base and the branch are Chocolate Chip cardstock. For the focal panel, I used Watercolour Paper and an Aqua Painter. First, I wet down the area I was going to colour, with water from the Aqua Painter. Then I picked up the ink colours from the ink pad lids, and added them. I started off light, then after each layer dried, went back and added a bit more colour, to create some depth. After watercolouring, I made sure my Aqua Painter was quite wet, and picked up more ink. One colour at a time, I then splattered ink across the panel. While the watercolour panel was drying, I used the Seasonal Layers Thinlits and die cut the flowers from Watercolour Paper, and the branch from Chocolate Chip cardstock. I dotted a bit of ink in the middle of each flower, then used the wet Aqua Painter to move it around. Next, I used a Sponge Dauber and sponged the edges of the petals with Berry Burst ink. Once the watercolouring was dry, I stamped the sentiment from the Thoughts and Prayers stamp set in Versamark ink, then heat set it in Gold Embossing Powder using the Heat Tool. All that’s left to do is put the pieces together! The branch and flowers are attached with Mini Glue Dots. The cardstock panels are layered with Stampin’ Dimensionals. Of course you need a sentiment for the inside of a sympathy card. The sentiment is also from the Thoughts & Prayers set, stamped in Melon Mambo. I then added a few of the flower images from the Colorful Seasons stamp set. I made several sympathy cards this weekend, as a friend requested me to make some for her. It’s unfortunate when you need them, and they can be difficult to make. However, I find it a bit easier if I find a layout or stamp set that I like using, and make several at a time. In other words – I’ll be sharing more sympathy cards with you this week! It’s nice to know that you don’t need a ‘strictly sympathy’ stamp set to create sympathy cards. Our stamp sets have beautiful images, and many lovely sentiments. If you’d like to recreate the card I made, you can order the supplies from my online store. Click on the product images below, or my signature, for my online store. I’d love to read any comments you’d like to leave! If you have any questions, please leave them too, and I’ll get right back to you! Previous Previous post: 3 Ways For You To Get the New Stampin’ Blends! Next Next post: It’s a Bird, No It’s a Plane – No it’s a STAMPARATUS! 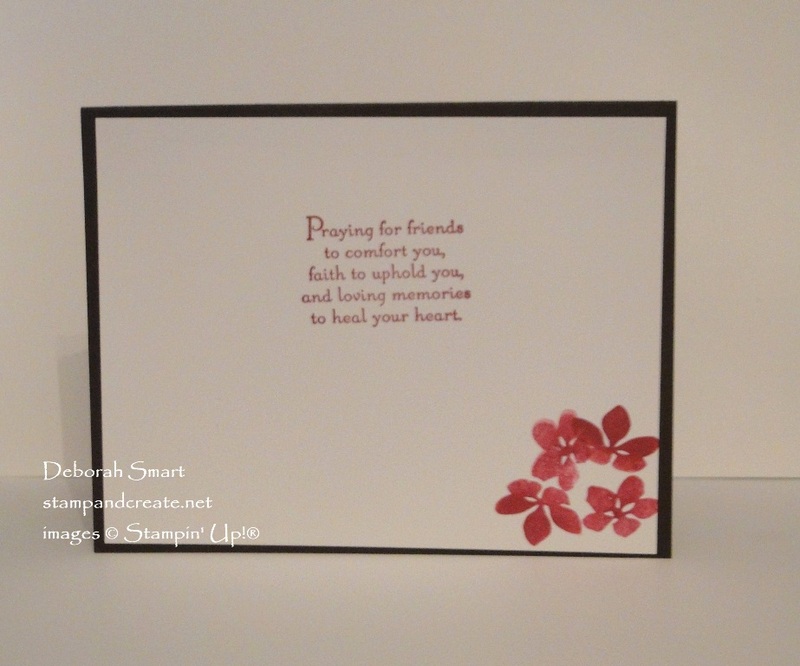 Beautiful and elegant sympathy card! The colors work for any time of year. TFS!